with Spink, London, no. K2 5487. During the late nineteenth century, the image of the country child came to symbolize humanity in its natural state - referring to the rural rather than the urban, youth before age and placing innocence above experience. Surveys of the London poor by Henry Mayhew and General Booth confirmed the cramped, insanitary conditions in which the majority of the population lived. By the 1890s health and strength were vital issues affecting public policy. It is not surprising to find among his many pictures of countryfolk produced after 1881 that in addition to yeomen farm-workers and women of the fields, George Clausen should also paint ploughboys, young shepherds and 'little haymakers'. Healthy children were essential to the rural community and they were often depicted working alongside older, more knowledgeable hands. This sequence, covering a four-year period, enables us to observe important changes in Clausen's work. Throughout the eighties Clausen had been under the spell of the French painter, Jules Bastien-Lepage, to the point where his work was castigated for being anti-British. The painter vigorously defended what he regarded as a kind of ultimate state in painting whereby objectivity, naturalism and empirical experience were prized above obvious emotion and imaginative fancy.3 For all its sentiment, A Little Child, was not sentimental.4 Clausen painted Annie Carter's features with great precision, selectively focusing, like a documentary photographer, upon her face and treating the background in a more generalized way.5 What offended his critics in the year of the Vizetelly trial, was that these practices were seen as 'French' and not British.6 Xenophobic critics stood on one side, and the followers of Impressionism on the other. These latter voices insisted upon métier and claimed that Bastien-Lepage was no more than a 'photo-realist'. The painter's touch, the direct linkage between sensation and the placing of the brush, was increasingly valued, and gradually, with The Mowers, (Usher Gallery, Lincoln) and Brown Eyes, Clausen's work began to change. The colours and textures of the face, clothing and the surrounding meadow are evenly weighted and like the Impressionists, Clausen permits the eye to bring separate touches of bright colour together. This radicalism continues in Young Girl, where there is greater emphasis in the movement of the child's pose. Where formerly her form would have been conveyed in regular 'square' brushstrokes, we now observe more slashing, expressive paint marks. Space in the background is suggested more by 'scraping down' the paint surface with a palette knife, than by strict perspective - a rich effect enhanced by working on panel rather than canvas. Having begun to use pastel in 1888, Clausen evidently sought to recreate some of its surface qualities in oil paint. At this point for instance, he was acquainted with the work of Edgar Degas and Claude Monet. We can date the completion of Young Girl with precision. 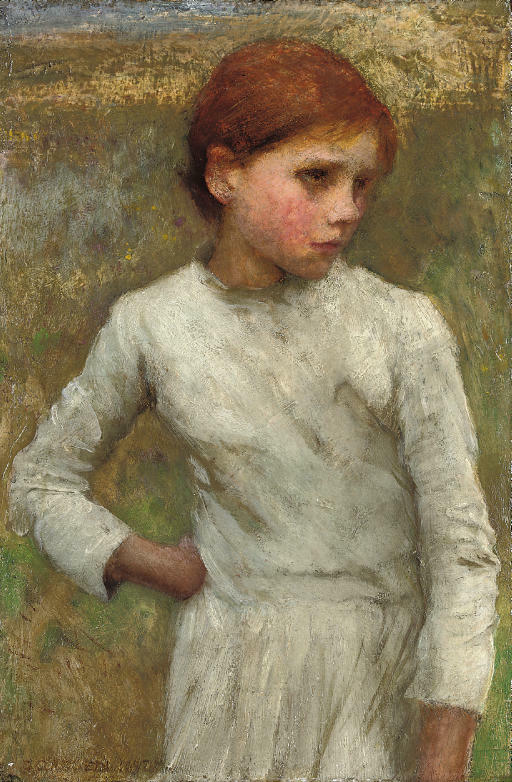 On 28 April 1892 Clausen noted in his account book that he had sent the 'little picture on panel (gesso) (Rose half length in white sand dunes background) Village Girl "pensive"' to Chapman to be framed and forwarded to Goupil, his dealer. On 14 May he received a letter from one of his clients named Stanley that he did not care for the picture he had recently purchased and would like to swap it for another. Clausen noted 'I propose to give him instead the little panel of Rose (pensive)'. Two watercolours were also included, but not surprisingly, Mr Stanley held on to 'Rose (pensive)' and these were returned. The four year sequence between A Little Child and Young Girl also covers the period when Clausen, his wife and five children left Berkshire for a bigger house at Widdington, near Newport in Essex (see lot 42). This new environment re-charged his painting, and helped to place a seal upon the academic 'naturalist' years. There was more openness and experimentation applied to subjects at Widdington which were essentially the same as those upon which he had addressed in Cookham. The first steps were taken with works such as Young Girl. Its greater emphasis upon setting, light and colour prepared him for major works like Evening Song, 1893 (fig. 2) and Noon in the Hayfield, 1897-8 (Private Collection). We are grateful to Professor Kenneth McConkey for providing the above catalogue entry. 1 Kenneth McConkey, Sir George Clausen RA, 1852-1944, 1980 (exhibition catalogue, Bradford and Tyne and Wear Museums), pp. 63, 67. Brown Eyes was sold to the Eton master, CN Luxmoore and bequeathed by him to the Tate Gallery in 1929. Luxmoore had been Clausen's neighbour at Cookham. 2 The watercolour, dated 1891, is a prototype for Noon in the Hayfield, 1897-8, sold Sotheby's New York, 28 February 1990, lot 122. The existence of Girl in a Field, suggests that Clausen may have begun Noon in the Hayfield at this time. This supposition is supported by Young Girl, the present work, and by the closely related drawings in the Bristol sketchbook (K2076) and in the Royal Academy, London. 3 George Clausen, 'Bastien-Lepage and Modern Realism', The Scottish Art Review, vol.1, 1888, pp. 114-5. 4 A fine distinction was made during the period between 'sentiment' - evidence of the painter's intimate engagement with the subject - and sentimentality, the crude mawkishness of much Victorian painting. 5 Clausen's interest in the effects of 'naturalistic' photography was expressed in a series of detailed letters of advice to the pioneer photographer, Peter Henry Emerson (1856-1936). See Neil McWilliam and Veronica Sekules eds., Life and Landscape: PH Emerson, Art and Photography in East Anglia, 1885-1900, 1986, (exhibition catalogue, Sainsbury Centre for Visual Arts), pp. 8-10. 6 In 1888 the publisher, Henry Vizetelly, following a parliamentary debate was taken to court by the National Vigilance Association for publishing Flaubert's Madame Bovary and recent novels by Zola in English translation. 7 Evening Song was sold Christie's New York, 22 October 1997, lot 139; for Noon in the Hayfield see note 2 above.